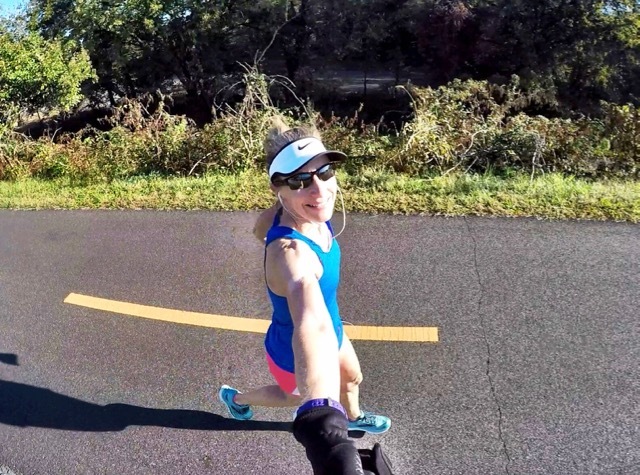 This past week completed week 13 of my 16-week Run Less Run Faster (affiliate link) training cycle for my OBX Half Marathon. Since we were traveling to visit my mom Wednesday evening through Saturday morning before heading to the Virginia Tech football game on Saturday afternoon, I mixed up my runs a bit so I wouldn’t compromise my training. I met my friend Tiffany at the track on Tuesday morning at 5:30 and other than a relative bright crescent moon and a few stars, it was quite dark. It was 39° when we started running, but had dropped to 36° by the time I left the track, and I could feel the difference. Scheduled for my track workout was 10 x 400 repeats at a 7:18 goal pace with 400-meter recovery intervals between each repeat, bookended by a 1-mile warm-up and 1-mile cool-down. I comfortably ran my warm-up and cool-down at right around a 10:00 pace and hit my 400’s at 7:25, 7:01, 7:07, 7:18, 7:14, 7:16, 7:10, 7:11, 6:57, and 7:33 paces. I found my way to the W&OD Trail a little later on Wednesday morning than I usually run. 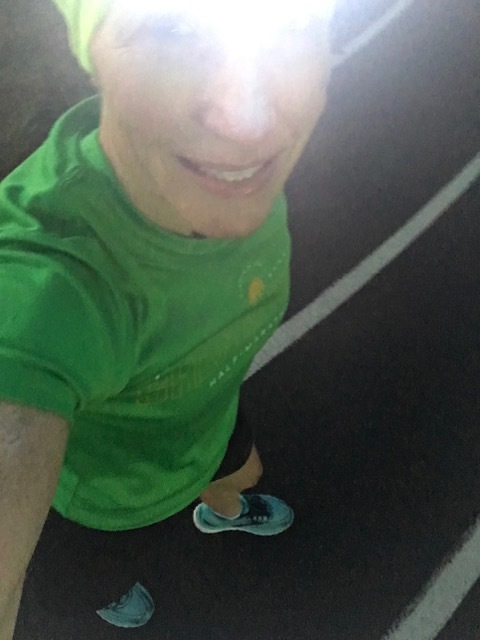 I keep Tuesday and Thursday mornings open until 7:30 so I can complete my runs before seeing my first clients; however, since I wanted to fit my tempo run in on Wednesday before driving to the other side of the commonwealth, I had to run after seeing my early morning clients. The sun was already shining brightly by the time I pulled into the trail parking lot, so I had to lather up with sunscreen. My training plan for Thursday’s tempo run was pretty straight forward – run a 1-mile warm-up, then 5 miles at an 8:28 goal tempo pace, and finish it up with a 1-mile cool-down. I hit my tempo miles at 8:57, 8:49, 8:47, 8:44, and 8:46. I wasn’t too concerned about running my tempo splits slower than my goal pace because I’d just had a hard track workout the previous morning. My long run for the week called for 15 miles at a 10:48 average pace. 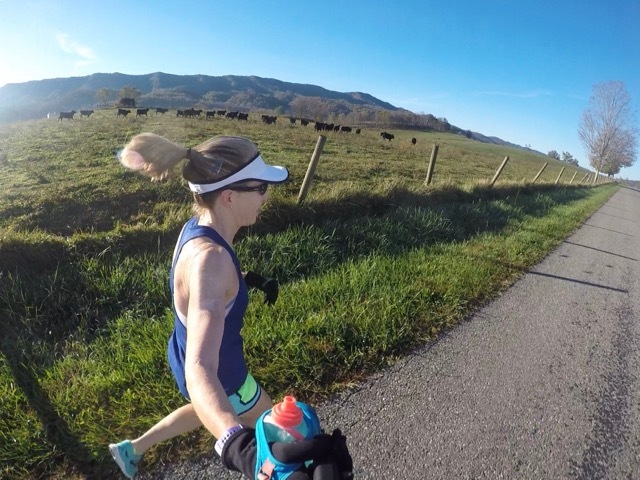 Because we were driving from my mom’s house to Blacksburg on Saturday morning, it made sense to go on my long run on Friday morning. It’s always significantly cooler in the mountains of Southwestern Virginia so I opted to head out a little later after the sun had a chance to warm things up a bit. Bill and I headed out around 8:15, and while it was only 37° when we started, it warmed up nicely to 60° in the sun by the time we finished. We opted to do a little exploring while out and picked a ridiculously hilly loop where five miles were on gravel roads. I hadn’t been on this particular stretch of road for at least thirty years and quickly discovered that I don’t like not knowing what to expect next on my running course. Friday also happened to be the four-year anniversary of my dad’s death, so I decided to visit his grave while out on my run. Dad was one of my biggest running fans and always wanted to know how my races were going, so it seemed appropriate to visit him while out on a run, and the course we’d created looped right past the church and cemetery. Despite the hills, loose footing, and M&M’s jostling around in my belly, I managed to maintain a 10:36 average pace. Bill stayed with me for the most part, but occasionally rode ahead and circled back. Without a running partner to chat with and without the ability to stream my favorite music app (no cell service), this long training run was one for building mental toughness. Late Saturday morning we hit the first of three tailgates, catching up with old friends as we made our way toward Lane Stadium, eventually catching up with Joseph and Julie who were down for the game. Kickoff was at 3:30 and we enjoyed another nice win. 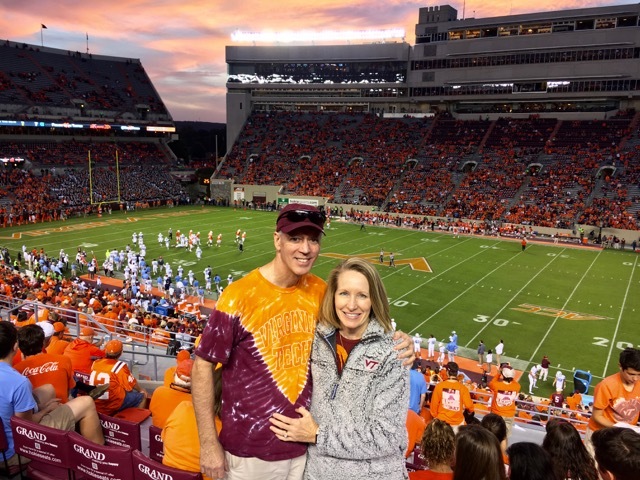 Just before the end of the game, we had someone take a picture of us with the amazing sun setting behind Lane Stadium. Looking ahead to this coming week, I’m thinking about writing the fourth of my running photography posts, and whatever else might come to mind. How do you build mental toughness? 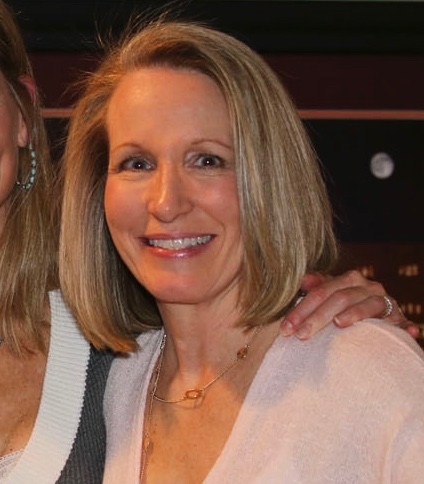 ~ I feel mental toughness is one of the things that successfully got me through 40 marathons. I trained alone for my first few marathons and never ran with music, in fact, I ran 39 of my marathons without music. What fun things did you do this weekend? Did you race this weekend? Disclaimer: This post contains affiliate links which means if you click on the blue product link and then make a purchase, I will receive a commission for referring you. You will pay no more or less for the product; however, Amazon will show their gratitude for my referral by paying me. I’m linking up with Holly at HoHo Runs and Tricia from MissSippiPiddlin for their Weekly Wrap. Be sure to check out not only the hosts’ posts, but the other great bloggers joining in on the fun! Wise words from where you’re coming from! I did miss your recap, so I’m heading over to read that now. 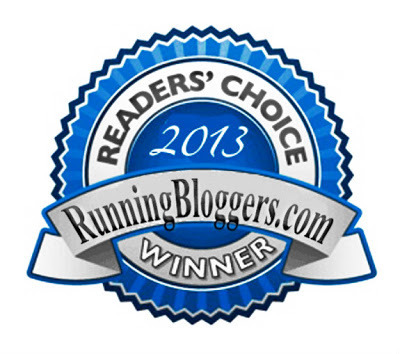 You might be interested in my book review from Friday when I reviewed Mindful Running. Definitely a must read for anyone who wants to work on mental toughness! I am constantly trying to improve my mental toughness, especially when it comes to running. I feel like I make baby steps each year, but I still have a long way to go. 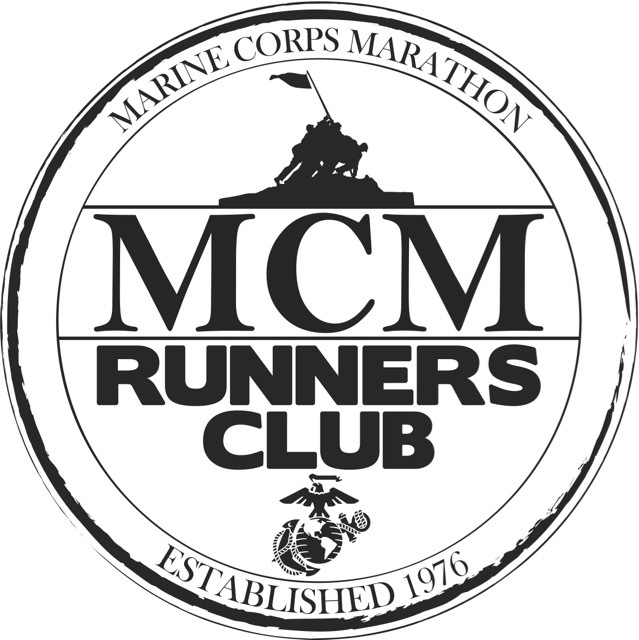 With every long run and marathon you’ll gain the experience you need to build on that mental toughness. I bet if you compare yourself right now to when you first started running you’d be surprised by the progress you’ve made. Great training this week! I think running on gravel is the hardest, especially those big chunks! Visiting your Dad’s grave seems very appropriate to do on your run. My Dad passed away long before I took up running but he was an avid long distance walker and loved being outdoors. I have no doubt he’d be pleased. Thanks for linking! I always like your photography posts! I always trained for my marathons with music but I didn’t listen to my iPod during neither of my marathons. I think it’s because I had someone to run with. If I was running by myself I would have definitely needed the music. I always say running is 90% mental and 10% physical. It’s always a work in progress for me. 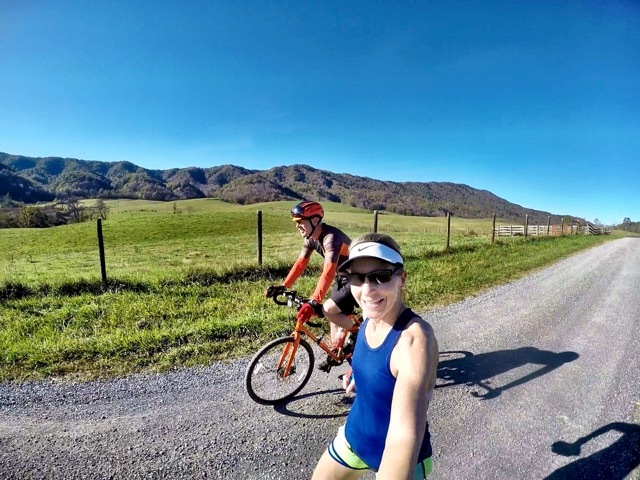 I need to work on my mental game – my long runs or races are so much easier to do when I have someone along for the ride. When I am alone, I tend to struggle a bit. I’m not a hopeless case, but I need to start working on that. I do find it so much easier and more enjoyable to run with a friend; however, if I’m racing, I need to be able to run my own race. 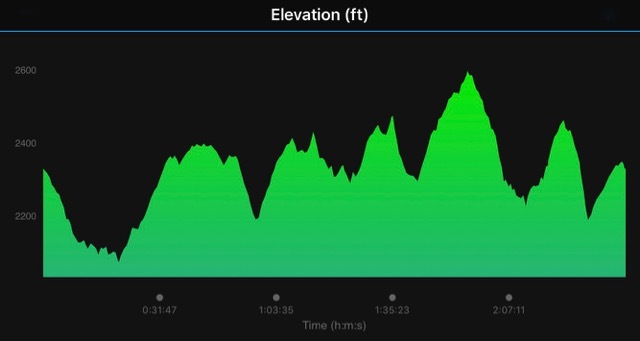 Wow, that was quite a hilly long run on Friday …but beautiful scenery! What a special moment to have visiting your Dad’s grave site. Congratulations on a great week of running and a VT win! Wow I can’t believe you’ve run so many marathons without music! I need it to keep myself going, as otherwise my brain starts counting all of my steps, which just puts me off. I did my first half marathon without music and thought NEVER AGAIN. 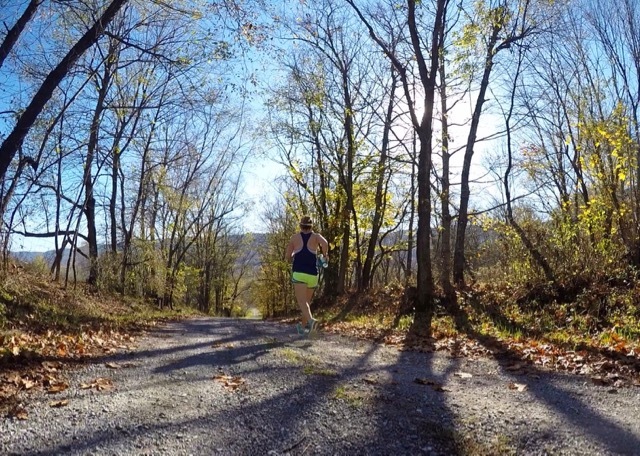 Looks like a great week of training, especially those tempo runs! You know, now that I’ve gotten used to running with music or podcasts I wonder how I ran without it; but what you don’t know, you don’t miss. Oh Deb, I’m just the opposite I love a new trail and I guess I like the part of not knowing what’s next. Your trail looks beautiful. Most all of our leaves are still on the trees even though it’s the end of October. We did enjoy some football fun this past weekend too!